Issued by the US Mint to celebrate 200 years of the use of the US Capitol Building was the 2001-P Capitol Visitor Center Commemorative Proof Silver Dollar. President George Washington laid the cornerstone of the structure in 1793 and seven years later, Congress had its first gathering in it on November 17, 1800. Its location in the new "Federal City" was so remote that many called it the "palace in the wilderness." At the time of the coin’s release, the Capitol received over five million visitors annually making a new Visitor Center for the Capitol a must. Surcharges on the sale of these coins went towards the construction and maintenance of such a structure. A surcharge of $35 from the Gold Five Dollar coin, $10 from the Silver Dollar coin, and $3 from the Clad Half Dollar was collected by the US Mint on the sale of each coin with proceeds to benefit the construction of a visitor center under the U.S. Capitol’s East Plaza. Struck from 90% silver, each Capitol Silver Dollar has a diameter of 1.5 inches. 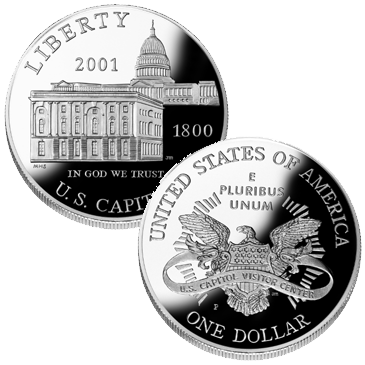 The US Mint released the Proof Capitol Coin on February 28, 2001. The initial price charged for the Capitol Proof Coin was $33.00. Each Capitol Silver Dollar was struck at the US Mint’s facility in Philadelphia and show the ‘P’ mintmark. 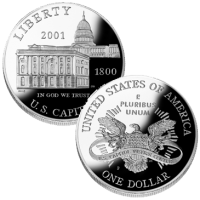 The obverse (heads side) of the coin shows two versions of the US Capitol. One from 1800 and the other a modern day version from 2001. It was designed by Marika Somogyi. The reverse (tails side) was designed by John Mercanti and shows a heraldic Eagle cloaked in a banner inscribed with "U.S. Capitol Visitor Center."